We’d love your help. 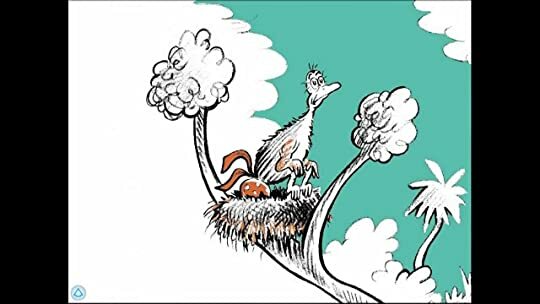 Let us know what’s wrong with this preview of Horton Hatches the Egg by Dr. Seuss. To ask other readers questions about Horton Hatches the Egg, please sign up. They say an elephant's word is the most trustworthy word in the world. Horton, our gigantic animal, agrees to hatch the lazy bird's egg. Zany it might seem but he manages to prop himself up and come what may, does not leave the fort. Not until the bird will return. Only that the bird does not return until very long. Until it's too late and a new mutated being is born. Dr. Seuss and his imaginations run at a berserk pace. The book tells the story of Horton the Elephant, who is tricked into sitting on a bird's egg while its mother, Mayzie, takes a permanent vacation to Palm Beach. 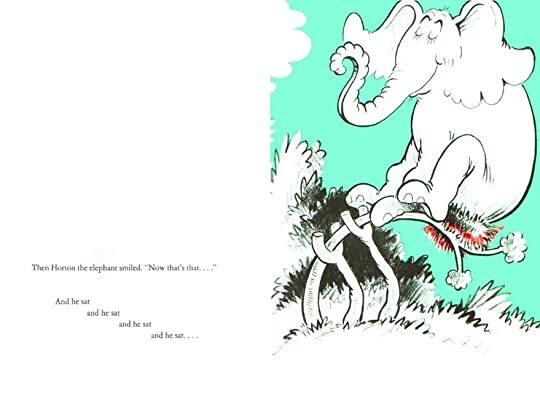 The book centers on Horton, a genial elephant, who is convinced by Mayzie, a lazy, irresponsible bird, to sit on her egg while she takes a short "break", which turns into her permanent relocation to Palm Beach. Horton Hatches the Egg is a children's book written and illustrated by Theodor Geisel under the pen name Dr. Seuss and published in 1940 by Random House. This is my favorite story of Dr. Seuss because it teaches young readers and reminds adults to be true to one's word. A very simple lesson to learn or to keep in mind, but the impact of not remembering is tremendous. In Horton Hatches the Egg, this lazy bird has got nothing to think about except how to plan and enjoy the vacations and holidays! So she finds someone who can do hatching for her, and then our immense, mighty, kind and faithful elephant, Horton comes into picture and agrees to help her go on holidays, by sitting on her egg on the top of a tree. He bears all the hateful comments and mockery of other animals. Hunters try to take him down the tree and all the other tormenting things happen to him. Bu In Horton Hatches the Egg, this lazy bird has got nothing to think about except how to plan and enjoy the vacations and holidays! But will his hardship serve him the best? Will he hatch the eggs as the title says? I am currently reading a lot of Dr. Seus books. They enjoyed this book. "Everyone laughs when Horton the Elephant offers to sit on Mayzie bird's egg while she goes on holiday. Horton's kindness and faithfulness are sorely tested when he, and the egg, are kidnapped and sold to a circus - but his reward for being faithful is more wonderful than he could ever have dreamed!" "Horton Hatches the Egg" is one of Dr. Seuss' most memorable classics as it stars everyone's favorite elephant, Horton! This time, Horton has his hands full as he tries his best to take care of a lazy bird named Mayzie's egg while she goes off to take a vacation. Unfortunately, hunters come in the jungle and they got Horton trapped! Will Horton get out of this dangerous predicament and still protect Mayzie's egg? Read the story to find out! Dr. Seuss had done a great job at both illustrating and writing this book. What was so unique about this book were the illustrations. 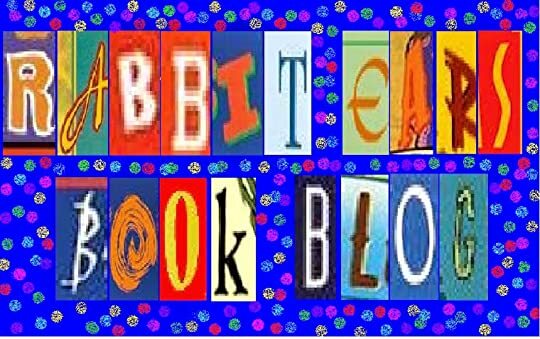 The main colors used for the images were blue, black, white and red, which makes the book extremely creative as few books use only three or four colors to color the images. Horton the elephant always wore a smile on his face, despite his horrendous situation, making him a truly innocent and friendly animal. A great trait that this book has shown is how loyal and determine Horton is as he was willing to take care of Mayzie's egg and he refused to let anyone tease him about taking care of the egg since he wanted to follow on his word that he will take good care of the egg. The only problem this book has, in terms of if it is appropriate for children, is that Mayzie was being selfish around Horton and she refused to take responsibility for taking care of her egg at the expense of Horton. But, don't worry, Mayzie's irresponsible actions are shown in a negative light and the story strongly encourages children to be more responsible and to not follow Mayzie's example of irresponsibility. "Horton Hatches the Egg" is truly a memorable classic about the importance of being loyal and keeping your promise to people and this book will easily be an instant hit for children everywhere. I would recommend this book to children ages four and up since there is nothing inappropriate in this book unless you count Mayzie's irresponsible behavior being unsuitable for children to learn from. Muchas reseñas hablan mal de Mayzie por haber abandonado su huevo ("es egoísta, irresponsable"), pero NADIE menciona a los tres humanos que apuntaron a Horton con escopetas, cortaron el árbol donde se encontraba, lo encerraron en una jaula, lo sometieron a semanas de navegación y luego lo vendieron a un circo... por diversión!!! ¿Dónde está el reproche de estas acciones? ¿Dónde están las consecuencias? Lindas rimas y dibujos, pero me molesta que el mensaje refleje que está mal renunciar a una res Muchas reseñas hablan mal de Mayzie por haber abandonado su huevo ("es egoísta, irresponsable"), pero NADIE menciona a los tres humanos que apuntaron a Horton con escopetas, cortaron el árbol donde se encontraba, lo encerraron en una jaula, lo sometieron a semanas de navegación y luego lo vendieron a un circo... por diversión!!! ¿Dónde está el reproche de estas acciones? ¿Dónde están las consecuencias? Lindas rimas y dibujos, pero me molesta que el mensaje refleje que está mal renunciar a una responsabilidad pero que no importa dañar intencionalmente a otro ser vivo. One of Dr Seuss's earliest books, and for me, his all-time best. I adore Horton! His determined goodness and those wonderful expressions on his dear face. I still read this several times a year and never fail to be pleased that things work out well for Horton in the end. 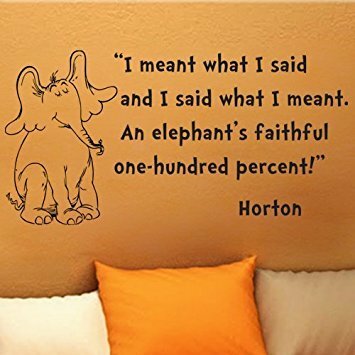 And clearly Dr Seuss was ahead of his time; as it turns out, research into their lives in the wild reveals that elephants are indeed faithful (one hundred percent). A fun and quirky typical Dr. Seuss book, focusing on themes of determination and sticking to one’s word. Poor Horton. Dr. Seuss's kindly elephant is persuaded to sit on an egg while its mother, the good-for-nothing bird lazy Maysie, takes a break. Little does Horton know that Maysie is setting off for a permanent vacation in Palm Springs. He waits, and waits, never leaving his precarious branch, even through a freezing winter and a spring that's punctuated by the insults of his friends. ("They taunted. They teased him. They yelled 'How Absurd! Old Horton the Elephant thinks he's a bird!'") Further Poor Horton. Dr. Seuss's kindly elephant is persuaded to sit on an egg while its mother, the good-for-nothing bird lazy Maysie, takes a break. Little does Horton know that Maysie is setting off for a permanent vacation in Palm Springs. He waits, and waits, never leaving his precarious branch, even through a freezing winter and a spring that's punctuated by the insults of his friends. ("They taunted. They teased him. They yelled 'How Absurd! Old Horton the Elephant thinks he's a bird!'") Further indignities await, but Horton has the patience of Job--from whose story this one clearly derives--and he is rewarded in the end by the surprise birth of... an elephant-bird. Horton Hatches the Egg contains some of Theodor Geisel's most inspired verse and some of his best-ever illustrations, the dated style of which only accentuates their power and charm. A book no childhood should be without. How can one not like Dr Seuss? In this typically zany tale, Horton the elephant agrees to look after lazy Mayzie's egg and once Horton has committed to a task, he sticks to it - come what may. Once Mayzie has persuaded Horton to sit on the egg in the nest at the top of the tree, she departs for a holiday in Palm Beach where she is pictured soaking up the sun, having a wonderful rest and determined never to go back to her nest. So that leaves Horton trying to overcome all obstacles, including some h How can one not like Dr Seuss? So that leaves Horton trying to overcome all obstacles, including some hunters who wish to shoot him down. But eventually he, the tree and the nest are commandeered for a travelling circus in which he becomes the star attraction. New York, Boston, Kalamazoo, Washington too and plenty of other places are visited. And then the show lands in Palm Beach. When settled at Palm Beach the circus is espied by Mayzie who zooms down to have a close look. She spots Horton, recognises him and ironically, while with him, the egg begins to hatch. Horton shouts, 'My egg, why, it's hatching!' But Mayzie suddenly becomes parental again and exclaims that it is her egg. I love this book. It is an all time favorite for me. This book conveys the importance of integratiy if the face of adversity. This book shows that different isn't bad and despite the challenge of being or doing something that is outside the relms of what is expected that the result of doing this with integrity and dilligence should result in the new beginings of acceptance. It should be...It should be..... It should be like that....but it is classified as a children's story. On the eve of the 8th month since my father's death, my partner read this book aloud to our 12-week-old daughter. He didn't know this, perhaps, but I did. I remember every month and the day goes by very slowly. I can still recite the intro to this book as I did with my dad when I was a kid. He would prompt me with the first line, and off I would go - "I'm tired and I'm bored, and I've got kinks in my legs!" We would do this until I thought I was too old, too cool, too annoyed by my father. Now, I On the eve of the 8th month since my father's death, my partner read this book aloud to our 12-week-old daughter. He didn't know this, perhaps, but I did. I remember every month and the day goes by very slowly. Now, I just wish he could read it aloud to his granddaughter, just once. So I could hear him again, just once more. My Grandmother would always tell me this story when I was little and staying with her. I always thought she made it up herself, until I got older. I just saw a Dumbo commercial that made me search for this and add to my read list so the next time I can’t remember the name I can find it. This book will always be a favorite just for the memories it brings. While reading this book I could have sworn that I read this book but could never find a memory of the book or even opening it until I realized that I saw the short film version created by Warner Bros. I loved watching that cartoon and now I realize that its based off from none other than Dr. Seuss. This book receives all the stars it deserves because the storyline was adorable, the illustrations were on point, and the rhyming scheme was perfect. I believe Dr. Seuss is one of the best ways of intr While reading this book I could have sworn that I read this book but could never find a memory of the book or even opening it until I realized that I saw the short film version created by Warner Bros. I loved watching that cartoon and now I realize that its based off from none other than Dr. Seuss. This book receives all the stars it deserves because the storyline was adorable, the illustrations were on point, and the rhyming scheme was perfect. I believe Dr. Seuss is one of the best ways of introducing poetry to children and the funny part is that kids do not realize they are reading poetry or that they are actually learning something through a children's book. I really believe that adults should read Dr. Seuss more often regardless if they have kids or not. We are introduced to the famous Horton the Elephant. One day while cruising the jungle, he meets a female bird name Mayzie who has recently just laid an egg but practically does not want to take care of it so she persuades Horton to take care of for a few hours so she may rest. At first Horton is reluctant but finally gives in but unfortunately Mayzie tricked him and decides to visit Palm Beach for a whole year. Meanwhile Horton is clueless when the mother will come back and will do whatever it takes to protect the egg regardless of the situation that come into play. I really enjoyed this story and it brought back wonderful memories of my childhood. 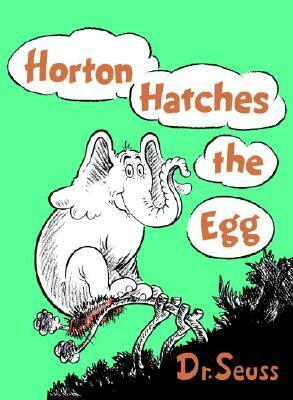 Horton Hatches the Egg was the first Horton written by Dr. Seuss and won the Lewis Carroll Shelf Award in 1958. Horton Hatches the Egg was the first Horton written, and I can thoroughly understand why this is considered a classic. The rhythm of reading perked me up no end, and I adored the illustrations. Simple, spare, with lots of humor. Aww, I love it! I'm finally getting to the source of those quotes I've been hearing all my life! Seuss does a great job telling this story with the rhymes flowing easily, making it a comfortable read about perseverance and holding to one's promise, no matter what with the blossom of fulfillment at the end. Horton is a white elephant who cares. Mayzie is quite the lazy mama bird. Hunters who see a good thing. Circus people who do a good thing. 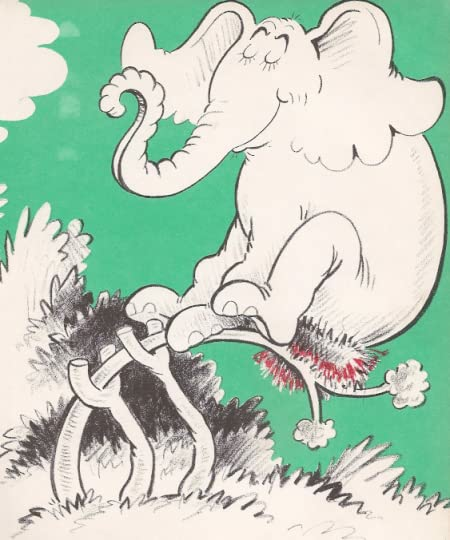 The cover has a bright green background with a white elephant perching on an orange nest set in the crook of a tree which had to be propped up. Below him is a black silhouette of grassy ground and white clouds in the sky with the title in orange as is the author's name tucked into the black ground. This is a lovely book by Dr. Seuss. Wanting to take a break, the lazy bird, Maysie convinces Horton to sit on her egg and wait for it to hatch. Unbeknown to Horton however, is that Maysie's 'break' consists of setting off for a permanent vacation in Palm Springs. Horton waits and waits, sitting there through all sorts of weather. He is laughed at ("They taunted. They teased him. They yelled 'How Absurd! Old Horton the Elephant thinks he's a bird! '"), and is even shot at by hunters! Horton shows how much of a patient character he is, and he is rewarded in the end by the unexpected birth of an elephant-bird. I am a real fan of Dr Seuss, so I enjoyed this story very much. Horton Hatches the Egg is also a very enjoyable book for children to read individually or for a teacher to read aloud to their class. The fantastic blend of rhyme, rhythm and repetition mean that this story is suitable not only for children who are in the early stages of reading, but also those who are very confident. "You've nothing to do and I do need a rest. Would YOU like to sit on the egg in my nest?" Esta é a história do ovo de um pássaro chamado Mayzie, que como muitas mãe está aborrecida de tomar conta do seu filho, que ainda não nasceu. Determinada a ir de férias para Palm Beach, Mayzie namorisca com Horton, um elefante simpático, que após os seus pedidos insistentes, toma o seu lugar em cima do pequeno ovo. Horton é amoroso e de confiança, ao contrário de Ma "You've nothing to do and I do need a rest. Horton é amoroso e de confiança, ao contrário de Mayzie que prefere viajar e divertir-se. Porém, apesar de muito diferentes, ambos ganharam a minha empatia. Apesar da difícil tarefa e das dificuldades sentidas, desde o tempo, aos animais curiosos e caçadores, Horton não abandona o ovo durante 51 semanas! When Mayzie the lazy bird lays an egg on top of a tree, she really cannot be bothered to wait for it to hatch, so she convinces Horton the elephant to do the job for her. He sits there through all sorts of weather, gets laughed at by the other animals, survives being shot at by hunters, and then gets transported by cart and boat only to be sold to a circus (whilst all this time remaining on top of the egg on the tree). During all of his sufferings, lazy Mayzie is relaxing on a beach oblivious to When Mayzie the lazy bird lays an egg on top of a tree, she really cannot be bothered to wait for it to hatch, so she convinces Horton the elephant to do the job for her. He sits there through all sorts of weather, gets laughed at by the other animals, survives being shot at by hunters, and then gets transported by cart and boat only to be sold to a circus (whilst all this time remaining on top of the egg on the tree). During all of his sufferings, lazy Mayzie is relaxing on a beach oblivious to the hardships poor Horton is going through. When the circus comes to the beach she decides to take a look. It is at this point the two characters meet again and some rather unexpected events unfurl. A very enjoyable book for children to read individually or to read aloud to your class. Due to the amusing storyline and Dr Seuss’ ‘unique blend of rhyme, rhythm and repetition,’ this is an excellent book for children who are just beginning to read as well as for more secure readers. This book would also be a good accompaniment for a PSHE lesson because it deals with the idea of parenthood and what characteristics make a responsible and caring parent. I have loved this book forever and forever. Horton the elephant, ever helpful, agrees to watch Mayzie the lazy bird's egg while she stretches her wings. That stretch becomes a semi-permanent vacation as Horton sits on the egg through all kinds of weather and even as hunters have him in their sights. The greedy hunters sell Horton to a circus and he travels far and wide. One week shy of a year, Horton's egg begins to crack and wouldn't you know it? Old Mayzie the lazy bird is back to claim what's I have loved this book forever and forever. Horton the elephant, ever helpful, agrees to watch Mayzie the lazy bird's egg while she stretches her wings. That stretch becomes a semi-permanent vacation as Horton sits on the egg through all kinds of weather and even as hunters have him in their sights. The greedy hunters sell Horton to a circus and he travels far and wide. One week shy of a year, Horton's egg begins to crack and wouldn't you know it? Old Mayzie the lazy bird is back to claim what's not rightfully hers anymore, especially considering that what emerges from the egg is as much of an elephant as it is a bird! Great read aloud, I especially like reading it to kids in Dayton, Ohio as it's mentioned in text. 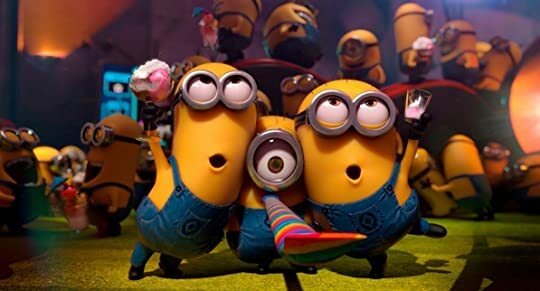 The repeated refrain is a phrase the audience picks up on before book's end and often chant with me when I come upon it in the story (which I love).